After three days in Fort Worth it was time to head back North toward home. We don’t like to do long days in the car, so we planned out a four day return with lots of sites along the route. 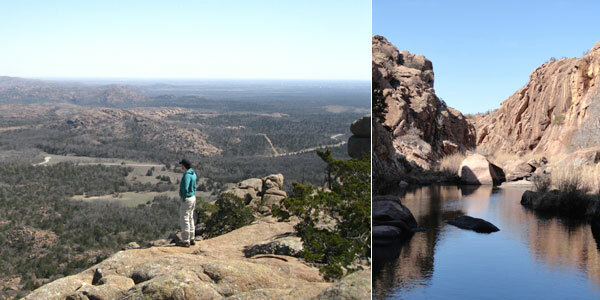 Our early plan had us passing through Oklahoma City on the way to an overnight stop in Wichita, Kansas, but another national park enthusiast clued us into the Wichita Mountains National Wildlife Refuge of southwestern Oklahoma. Wichita Mountains National Wildlife Preserve: (L) The view from Elk Mountain. (R) The Narrows. Who knew there were mountains in Oklahoma? The area is about 100 miles southwest of Oklahoma City and about 3 hours by car northwest of Dallas/Fort Worth. It is a small cluster of peaks that stand out about 1,000 feet above the surrounding rolling landscape. They are the remains of an ancient chain that reached all the way west toward present-day Amarillo, Texas 500 million years ago. We of course stopped at the visitor center to view some informational displays and chat about hiking options with the rangers. They suggested Elk Mountain trail and The Narrows so we did both, about 3.9 miles of hiking in all. Elk mountain provided a great overview of the surrounding mountains and valley below. The Narrows is a great, but slightly hard-to-follow trail that goes along a small stream through a steep-walled, winding crevasse. 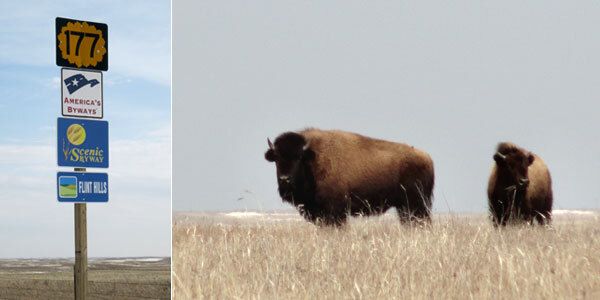 It was a great wildlife viewing day with sightings of many open-range bison, longhorn cattle families and a prairie dog town. Everyone loves a good prairie dog town. (L) Entering the Flint Hills Scenic Byway. (R) Moody bison stares down curious hikers. After the Wichita Mountains we continued 4 more hours to the city of Wichita in Kansas. After some beer and good times with an old friend, we headed out the next morning for the Tallgrass Prairie National Preserve in the Flint Hills region of Kansas. The Flint Hills Scenic Byway got us off the turnpike and into the small towns and fields. The rocky, terraced hills of the area mean the ground was not suitable for plowing. As a result, it was only used for grazing and now contains North America’s largest preserve of tallgrass prairie. This vegetation used to cover a full third of the continent, but now only 4 percent remains. These 10,894 acres are the largest intact piece left. Tallgrass Prairie is the second newest national preserve and the only one dedicated to this ecosystem. There is a brand new visitor center, some restored ranch buildings and miles of trails. Friendly park ranger Jeff suggested a 3.5 mile backcountry loop route and pointed out where we might see their herd of 24 bison. He also warned us that they had been “moody” lately and advised us to give them a wide berth before we set out. I wouldn’t say early spring is the most scenic time to be there, it’s surely much prettier in the summer, but we did come across that bison herd and it was well worth it. 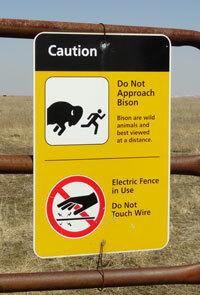 “Do bison just charge you or do they gore you?” Nick asked. We didn’t want to find out, so we snapped some photos from a reasonable distance and continued on. This entry was posted in Destinations and tagged Council Grove, Flint Hills Scenic Byway, Hays House Kansas, Kansas, Oklahoma, Tallgrass Prairie National Preserve, Wichita, Wichita Mountains National Wildlife Refuge. Bookmark the permalink. Glad you got a chance to stop at the refuge!